Welcome to the REU Smartphone Privacy page. This is part of the 2011 Research Experience for Undergraduates program at Oakland University. We presented our progress thus far in our midterm presentation. We have been studying privacy policies for the past few days. Many large companies' websites, such as Google, Yahoo, and even the Oakland University website, have policies, some directly related to privacy and others not so much. The consumer should be notified before his private information is collected. He should know what information would be taken and what it would be used for. This is the most fundamental value because without awareness, the consumer cannot make educated decisions regarding his private information. The consumer should be able to choose whether or not to share his information, what information he wants to share, how he wants it to be used, and to whom it can be passed on to. The simplest example of this is opt in/opt out, where the consumer chooses whether or not he wants to give his information. The consumer should be able to see the private information collected from him, and be able to edit that information if inaccurate. The method of access should be quick, inexpensive, and easy to reach. The collectors of the information should protect the data with reasonable measures. They should make sure to keep it safe from other, unauthorized parties. We put up a draft of an overview talking about smartphone privacy and its policies. There are two candidates for the architecture for 4G, LTE Advanced and IEEE 802.16m. LTE specifications on security are still being developed; documentation states “The 3GPP System Architecture Working Group 3 (SA3) is responsible for security and has decided to use either Advanced Encryption Standard (AES) or SNOW 3G algorithms. Specific modes for AES are still being determined…” (19). There is no mention of any privacy standards in the LTE model. IEEE 802.16m is further developed, and includes implementation of an independent Security sublayer, which “provides subscribers with privacy, authentication, or confidentiality across the broadband wireless network” (20, p. 491). This includes a Privacy Key Management Protocol, which establishes “a client/server model between the base station and subscriber station that is used to secure distribution of keying material” (20, p. 17). SMS: Operates the text messaging service found on all basic and sophisticated phones. The packets of text are limited to 160 characters in length. Most network operators do not develop services for SMS on WAP (16). CSD: Data transfer over voice. The system either uses an onboard analog modem, or connects to a remote modem via phone call. As the transfer uses an analog modem, data speeds are limited (16). USSD: Session-oriented service, used originally for administrative purposes, but can be used for two-way transactions (16). The USSD bearer frequently is a dialed service, following a formatted structure, and can be used to check balances, make transactions, or other miscellaneous operations (18). 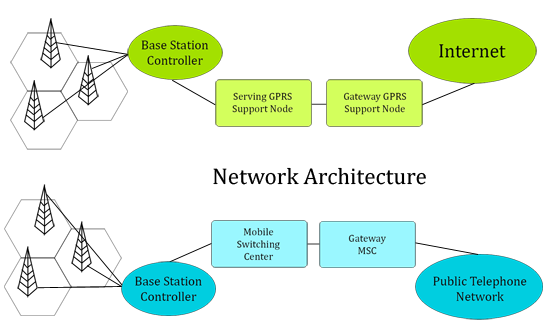 GPRS: Serves as a supplement to SMS and CSD, utilizing variable speed and latency to maximize efficiency (16). 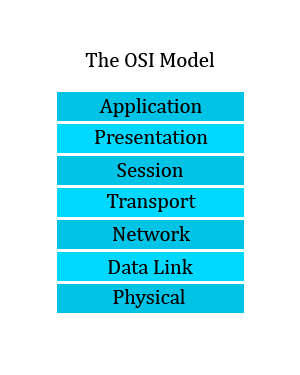 The protocols, hardware, and software of the Internet is organized into five layers. Each layer offers services to layers above it, and are serviced by the layers below it. For mobile networks, the protocol stack changes slightly. 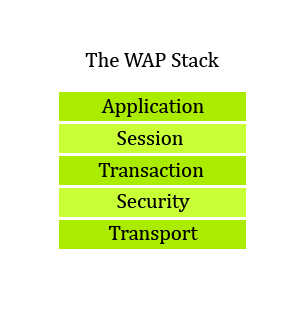 The model used is called the Wireless Application Protocol (WAP) stack, which also has five layers: the Application, Session, Transaction, Security, and Transport Layers (17). A variety of bearers are utilized to translate data to and from the web and the client (16). We looked at existing privacy and security requirements regarding the internet. It seems there are no official privacy requirements for internet and ISDN connections. According to the "ITU-T IMT-2000 Security Requirements: Capability Set 1," user privacy "between the core network and [the internet] is beyond the scope of IMT-2000 standards" (12). Because of this, the responsibility of internet user privacy, especially with regard to smartphones, is passed on to the phone manufacturers and application developers, resulting in varying degrees of reciprocity. Apple's App Store has a small barrier to entry for developers who wish to a create app, along with a review board for all independently produced apps. On the other hand, privacy for products on the Android Market is left almost entirely up to the individual developer. Thus, even though Android apps must be signed, they may not necessarily be safe (13, 14). This group researches the vulnerability of smartphones, namely malware and the vulnerabilities of network interface integration and applications. Computer Science researchers from Rutgers University discovered a software attack that could severely compromise the security of smartphones. The computer science department at Carleton has several researchers researching smartphones. Nokia Research Center reportedly claims to research High Performance Mobile Devices. An emphasis is put on Mobile platform security and privacy. Does research on a number of topics, notably the "mobile wireless ecosystem," a broad range of topics covering 4G infrastructure, hardware, chipset technology, and consumer end growth.